Card Captor Sakura is an anime based on the marvelous manga series by Clamp of the same name. 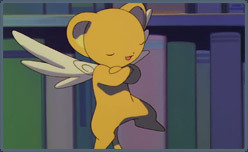 On the bare surface, CCS will seem like another card/monster anime that resembles Pokemon. A bit deeper down, one will find that CCS is nothing like that. Card Captor Sakura is an anime that doesn’t take itself very seriously and goes for a more lighthearted atmosphere rather than being very serious. The result is a rich blend of comedy, romance, action and memorable characters. 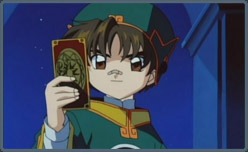 Card Captor Sakura tells the tale of Sakura Kinomoto. A normal, average 4th grader, Sakura returns home one day, only to hear some queer noises coming from inside her father’s study. 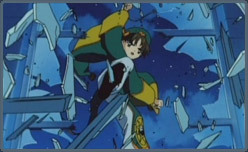 Mistaking the sounds for that of a burglar, she inspects the area and accidentally releases the Seal of the Book of Clow. 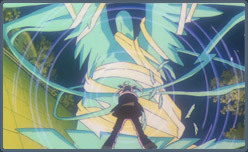 In doing so, Sakura also scatters the “Clow Cards” present in the book and therefore releases monsters that have been long since sealed for many years. Now, along with the beast of the Seal, Keroberos, Sakura must capture back the Clow Cards and prevent a prophesized catastrophe from happening. Sounds like an average plot for an average anime. 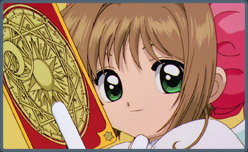 Quite to the contrary, one of the best things about Card Captor Sakura is its story. Based on the Manga by Clamp, CCS has a story that is very well defined, well planned and has a few very shocking twists and turns. The first season consists of Sakura capturing the Clow Cards with friends Shoran, Meiling, Tomoyo and Kero (Keroberos). The second season is set in the aftermath of the Captured Cards and how Sakura proceeds to take the place of Clow Reed and become the permanent master of the Clow Cards and it’s guardians. Along the way are a bunch of interesting sub-plots and character relations that develop as the series progresses. As the people around Sakura get to know her a lot better, they become enchanted with her bubbly and cheery personality and can’t help but love her for who she is. The cast of characters in Card Captor Sakura is very diverse. Each of the characters presents their own entertaining roles that contribute immensely to the overall feeling of realism that the anime does so well to give. May it be major characters like Shoaran Li who rivals Sakura for the Clow Cards, and later becomes deeply attached to her, or minor characters like Yamazaki who provide the interesting comical moments to lighten the feel of the anime. The characters, are all very well done and not one feels useless or out of place throughout the anime. Unlike most anime that revolve around magic and monsters, Card Captor Sakura doesn’t only focus on magic but it also gives primary focus to Sakura and her relations and interactions with the other characters. There’s an interesting element of mystery of Sakura’s family that is slowly revealed as the series progresses. Through the series we get to know of Sakura’s Grandfather, her aunt, her mother and her second cousin. Then there’s the very complex love Triangle between Shoaran, Sakura and Yukito (Sakura’s elder brother’s best friend). Couple this, with the mysterious events of the Clow Cards, it’s creator Clow Reed and the various people involved in the catastrophe, and Card Captor Sakura pretty much nails everything you would want in an anime. The art and animation of the anime are pretty decent. Some of the weirder expressions of the characters that tend to suddenly resemble stuffed toys can take a bit of getting used to, but despite being a pretty old anime, Card Captor Sakura still manages to do pretty well in the Animation and Art departments. It does justice to the very superbly drawn Manga by Clamp. The music in the anime complements the various scenes found in it perfectly. Everything sounds and feels right, and gives the feeling that the specific part of the anime is attempting to convey. Perhaps the only drawback to the music are the rather lacking opening and ending themes that follow after the first set. The voices, are of course, very suited to each character and the voice actors do a splendid job of conveying each and every dialogue. The sound of the anime does a great job of contributing to the anime’s overall appeal. The anime does have its drawbacks though. For one thing, not everyone will be able to appreciate the light-hearted feel of the anime. Others will probably be annoyed at seeing Shoaran Li being slowly shelved into the background as the series progresses. While these flaws are minor, they only annoy a set type of people, and it’s more or less likely that most people will enjoy the anime for what it is. 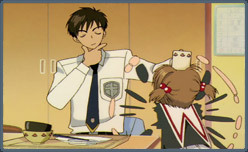 Overall, CCS is a classic. It’s one of those anime that does a great job of blending a light-hearted middle schooler’s life with mystery, magic. There’s action, comedy and even a bit of romance. Although some people may not be able to appreciate the light feel of the anime, it’s a guarantee that most viewers will be enchanted by this superb, sweet and cute 70 episode series. We award Card Captor Sakura with an A for achieving near perfection of virtually every front.